This eco-print silk wrap was one of those lucky accidents that just may help to propel my echo print technique to the next level. The scarf was first dyed in a poppy red, then dyed with a variety of leaves (catawba, dogwood, eucalyptus, fern, grape, tulip poplar) and hydrangea flowers collected on Roanoke Island. 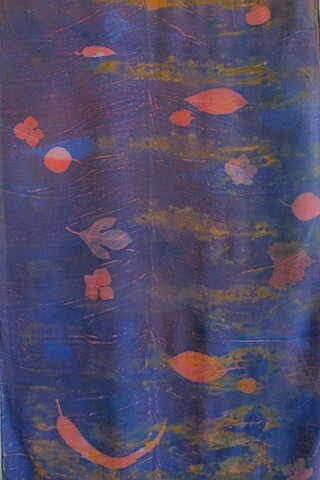 The plant prints were then highlighted with a rich dark purple acid dye color. I love how the red base dye helps the plant prints to appear to glow in the background. This wrap is a very special piece of wearable art.